I have a guilty secret. (All right, I have more that one of those, but let’s stick to one at a time.) You see, I have lots of books on my shelves (and on my Kindle) that I’ve never read. I don’t mind the ones on the Kindle so much; they’re generally things I want to try or series where I’ve got behind in my reading but not my purchasing. But the ones on the book cases, those I regret, because so many of them are the lost books of my childhood and youth. When I was young, I would discover a new author, fall in love with their work and want to have all their books at once. Of course, I didn’t have a job or even much pocket money, so that was easier said than done. I did the obvious thing. I haunted second hand bookshops and library sales and bought up whatever was there that I could afford. I ended up with lots of old (and sometimes very tatty) paperbacks, most of which remain on my bookshelves to this day. However, I was a young and new reader, which meant there was a downside to this. I never found the time to read all of them, because the next exciting new author would come along and I’d do it all over again. 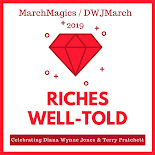 Some examples of such authors are Mary Stewart, Georgette Heyer, Dorothy L. Sayers (I did eventually get all those read due to joining a Sayers mailing list at some point in the last decade or so), Dorothy Dunnett, Margery Allingham and, of course, Diana Wynne Jones. There are others too, I’m sure. Here’s guilty secret number two. I’m an avid reader, but I’m a sporadic blogger. I’d love to be a better one, but life, family and illness (I have ME/CFS) tend to get in the way. In June 2011, I decided to move from having a general blog to a reading blog (I hesitate to call it a book blog, as it tends to be little more than my reactions to the books I’ve read, when I feel well enough to write something down). One of the features I planned for this new blog was to read some of those unread books. I had already considered reading the DWJ books I owned and never read when I realised how very unwell she was, not long before she died. She was one of my first “Author Reads” with the idea expanding to all her books, not just the ones I owned and hadn’t read. I’m working through Mary Stewart and Georgette Heyer (and a few others) as well. I also added Anne McCaffrey when she also died in 2011. I admit I haven’t got far yet. I’m up to Power of Three (which I intend to have read by the time this post goes live) and I skipped ahead to read Dogsbody to my son and Fire and Hemlock when Kristen held a readalong of that book. It’s only six out of 36, but I love knowing I have all those books waiting for me to get to them. I gave myself no time limit for reading her books, just a plan to do it and enjoy myself while I do. I admit that so far, my favourite books haven’t changed (Eight Days of Luke, Dogsbody and Fire and Hemlock) but there are plenty of rereads and new reads ahead of me. I’m looking forward to it ever so much. I’m not going to rush, I’m going to savour each book (and hopefully get my son to join in with me for at least some of them; I’m sure he’d love Archer’s Goon for example). I’m not going to care if it takes me weeks or years to work through to the end. I don’t even want to acknowledge that there is now an end of her wonderful stories, but I guess I can always start all over again if I wish. About Kerry: I’m a wife and mother of one, living in New Zealand, who has ME/CFS (which tends to rule my life a lot more than I would like). I only manage to blog sporadically, but you can find my bookish posts at Too Many Books, Too Hard to Choose (http://rocalisa.wordpress.com) and stitching stuff at Sometimes Stitching (http://lahaylia.wordpress.com). Points to anyone who can guess one of my favourite authors from the URLS of my blogs. 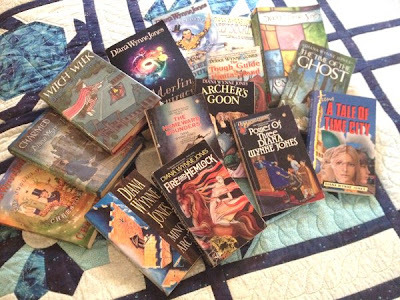 My eyes are like saucers to see all those Diana Wynne Jones books all in one place, even though I own all of those books. They're never all in one place! Now I want to put them all in one place and take a picture. I've recently read the last of the DWJ books I hadn't read before. It made me way sad, but of course I can always reread them a zillion times, which makes them better anyway. Oh, I'm envious (in the nicest possible way) -- what a lovely pile of DWJ books! I've only read a few so far, but there's something really special and unique about DWJ. Someday, I'd like to do as you're doing, and read through a bunch of them in a row. There's something really fulfilling about reading an author's work chronologically. You get to see them develop and you move through their phases with them. Sometimes this goes wrong when an author's quality drops off at the end though. Luckily, Diana was brilliant until the end.